This week I have been testing out some recipes from The Allergen-Free Baker’s Handbook, and the Gingerbread Muffins really caught my eye. The ingredients in this recipe are nice and wholesome, and I just happened to have a jar of unsweetened applesauce begging to be opened. Unfortunately, my husband doesn’t like all things ginger. So, I switched the recipe to cinnamon, and a delicious on-the-go breakfast was born. Texture seems to be the biggest downfall of so many gluten-free baked goodies, but these muffins really hit the mark. They have a light crunch from the brown rice flour – I didn’t use Authentic Foods Superfine Brown Rice Flour, which Cybele recommends (this may produce a superior result). 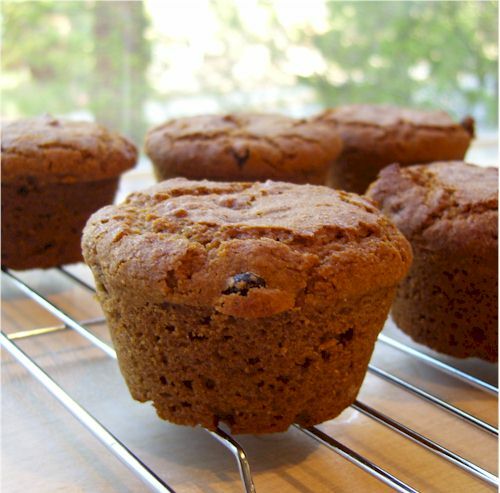 They are quite hearty like a bran muffin, but still soft and muffin-y – no doorstops here! The original recipe calls for agave nectar, but I was craving some maple love. And indeed, these muffins have a very rich maple flavor. In fact, if maple is too expensive in your neck of the woods, you could even reduce the maple to ¼ cup and increase the honey/agave to ¾ cup. On that note, these muffins are quite sweet (even though I reduced the sweetener a touch), but a genuinely pleasant indulgence. Recipe adapted from the Gingerbread Muffins in The Allergen-Free Baker’s Handbook by Cybele Pascal. This recipe is Dairy-Free, Gluten-Free, Egg-Free, Nut-Free, Soy-Free, Refined Sugar-Free, Vegetarian, and optionally Vegan. Preheat your oven to 350ºF and line or grease 12 to 14 muffin cups (the original recipe calls for 12, but I needed 14). I like to soak the raisins in hot water while I prepare the other ingredients. 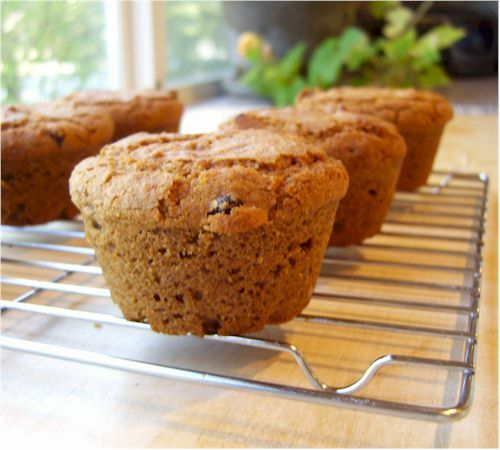 This plumps them up a bit and helps to prevent any exposed raisins from burning while baking. Combine the rice flour, starches, cinnamon, xanthan gum, baking soda, and salt in a medium-sized bowl and set aside. Combine the applesauce, oil, maple, honey, and milk alternative in a large mixing bowl. Stir in the reserved dry mixture until the mixture is just combined. Drain the raisins (if you are soaking) and fold them into the batter. Evenly distribute the batter between 12 to 14 muffin cups. You will be filling the cups pretty much to the top. Bake the muffins for 30-35 minutes if making 14 muffins, 35-40 minutes if making 12 slightly larger muffins. The muffins do darken quite a bit, but weren’t burnt. Feel free to check in earlier if you want more of a moist muffin. I’m really enjoying using her cookbook over time. The superfine brown rice flour does, in my experience, work much better than regular brown rice flour. Great muffin recipe. Perfect way to start the day! I love all things ginger so I may just have to revert back to the original and make these! They look so good. Yum! I love cinnamon anything! I have yet to invest in xanthan gum. I am kind of afraid of it to tell you the truth, I have gotten away with not buying it yet. These look delicious! Hope you are well Alisa!!! Maple and cinnamon are impossible to combine and have turn out poorly. If I were at home, these would be in my oven baking right now! Such wonderful looking muffins! And they sound superb with maple and cinnamon! Alisa — these look fab! I can’t wait to try them (or a version of them). Beautiful photos, too. I’ll bet these smelled divine while baking! My husband is also averse to ginger… I guess that’s why he only ate *half* of my ginger-dark chocolate bar! Thanks for a recipe that will please us both. I love how “free” these are and can’t wait to try your adaptation. I also have this cookbook and am really enjoying it. I’m going to give your adaptation a try, perhaps with the addition of walnuts. Yum!!! I know what I’m having for breakfast tomorrow morning! You can put brown rice flour in your blender or coffee mill and process it into superfine brown rice flour at a considerable savings.